Some students just seem to be better studiers than others. What's their secret? It may be a couple of factors. However, it's handy if some of your supplies for college are great dorm items for studying. With that in mind, add study supplies to your college shopping list and let some fun dorm stuff that's also useful for studying be a key part of your college shopping. With these Multi-Colored Stick On Flags, you'll get some study-aiding supplies that will help you save time and be more efficient. 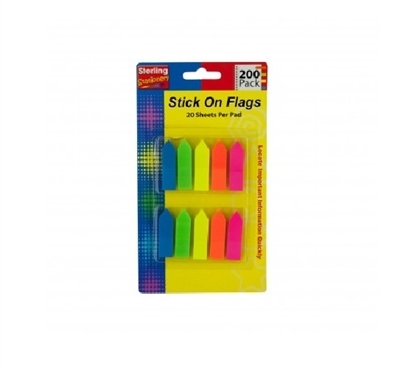 These little sticky notes are great for helping you be a more efficient studier and reader. You can quickly mark a page that's important or indicate an area of importance in the text. Plus, they're colorful and cool little college supplies that will be useful for each class. So long as there's textbook reading to be done, which there is, these little stickies will come in handy. So set yourself up right for your college shopping by including these dorm accessories on your college checklist.